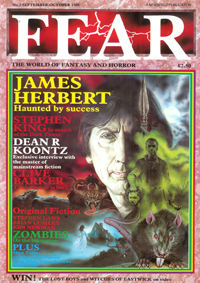 Onto the second issue of Fear, dated September/October 1988, this time with 84 pages, eight more than the launch issue. A bright pink marbled background supports a wonderful portrait of James Herbert and his rats by Oliver Fry. 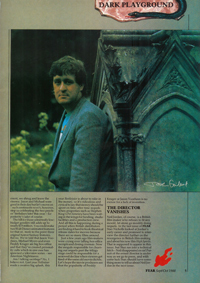 In his lengthy editorial, Dark Playground, John Gilbert discussed the lack of funding within the British film industry and the lack of entrepeneurial flair in the film-makers themselves. He wonders if there are people out there who can take advantage of the perceived new opportunities for the horror genre in film, and in fiction, ‘as several of Britain’s larger publishers are desperate to sign-up horror writers this year, ready to exploit another bubble in the genre which they believe has started to – yet again – expand and can only grow bigger during next year’. Gilbert then discussed the ‘advice’ he received when he set out to publish Fear. You just know what’s coming: don’t bother, it’ll never sell. Putting hindsight to one side, I firmly believe that if you can develop quality content, present it professionally in terms of copy and imagery, and find a distributor that believes in you, people will find it and follow. This is especially the case today when only a few minutes research can put the inquirer in touch with the creators, provide an overview of the product and enable a purchase. So different to the trek to the newsagents, or the bus ride to the next town, all in search of a paltry magazine – absolutely unheard of today! And I miss that search, for if I hadn’t religiously sought out each issue of Fear I feel I would be less of a fan, less of an obsessive, (aka collector), than I am today. And Fear is where my bug began. Gilbert responds to fan letters telling him to encourage new writing talent: ‘The truth is this: I will publish at least one piece of fiction from a “newcomer” in every issue of Fear – that’s been the plan from the start. 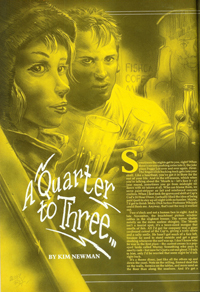 Hand on overburdened heart, I can say that I’ve had more than 40 short stories from readers since the magazine first appeared…’ Submission length was 1,500 to 4,500 words – not a bad end length at all methinks. And this approach resulted in first sales for several household names of today, whom I’ll mention in future Fear articles. In the final section of his editorial Gilbert looks at the current trends in the US film industry – sequels, prequels and remakes. How times haven’t changed – money motivates. His thoughts echo my own, and those of most of us I expect: ‘Sequels and remakes may be money-spinners, but they should only be made if Part II or III carries on the plot of the first movie forward – like Hellbound – Hellraiser II – or the remake adds something to the original – like Evil Dead II or The Blob… Just a few years ago film-makers were crying over falling box-office receipts and closing cinemas. Now the moguls responsible for churning out sequels past the trilogy stage could be responsible for a renewed decline when viewers get tired of the same old movie cliches. Let’s hope the movie producers see that the popularity of Freddy Kruger or Jason Voorhees is no excuse for lack of invention’. Oh well, as news of the Alien remake/prequel begins to leak out; as we see the first shots of the remake of Nightmare on Elm Street; and as Hellraiser‘s remake gathers momentum we can only hope these classic and memorable experiences are injected with vigorous and convincing creativity and a humble repsect for their original visions; and I guess, we must appreciate that the majority of these ‘re-inventions and revisits’ are not for us, but for our children. And that they will forget them pretty quickly if they’re no good. One wonders if today’s teenagers will have the same sense of nostalgia, given today’s fast-paced society. (However, I do hold out great hopes for the Hellraiser remake, seeing as it’s gone to the director of Martyrs, Pascal Laugier). But it’s nice to be able to comment upon them knowing what’s gone before. My memory is grainy, but the second issue of Fear was possibly my first relatively comprehensive introduction to the zombie film genre in the form of Philip Nutman’s excellent and timely overview, Dead or Alive? 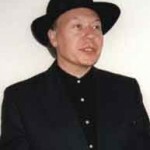 Nutman concentrated on the voodoo side of zombie lore, as it was around this time that The Believers, the second Return of the Living Dead, and Wes Craven’s The Serpent and the Rainbow were out and about in British cinemas, possibly inspired, or given new life by Alan Parker’s Angel Heart. John Gilbert followed up his article on film-making from the first issue with Tales of a Lonely Scriptwriter: “No director is going to thank you for a description of a massive bedroom if all he can afford is a plywood shack.” Paddy McKillop traces the development of Stephen King’s The Dark Tower 1: The Gunslinger and the planned series, which at the time were a bit of a gamble: “King feared his mass-market readers might be disappointed with a story of sorcerers, magic and other worlds.” Time has certainly proven otherwise. A new feature was the introduction of The Spook, a diary column from an anonymous lady possibly working within the world of genre publishing – or completely made up. She was also referred to as Lady Ligger, the Mistress of Gatecrashers. “Maggots, beetles, members of the living dead, parasites and the dregs of society. No, I’m not talking about John Carpenter’s Prince of Darkness, I’m talking about the party at London’s Limelight Club which promoted it.” In this issue she attends the opening of Forbidden Planet’s new London Megastore where she bumped into Willie Rushton – oh what a grand place that was – remember the weirdly round comic room at the back? And does anyone know who this quaintly titled Dame was/is? Fan-File featured the relatively new fanzine Skeleton Crew that dealt with one author or subject per issue. There’s a plug for the awesome Midnight Graffitti which includes journalism from Rick Kleffel who currently runs The Agony Column. Ghosts and Scholars, an MR James newsletter is given a mention – this is still published today. Shock Xpress, a magazine that focused on the sleazier side of horror is detailed. Years later I would write alongside editor Stefan Jaworzyn on the industrial music magainze, Music From the Empty Quarter. Dave Carson’s Haunter of the Dark portfolio is featured, published via Dagon Press, who appropriately enough published Dagon magazine. 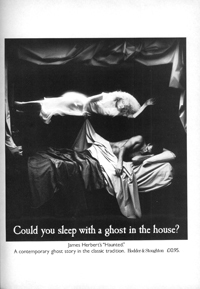 Here’s an advert for James Herbert’s Haunted from Hodder and Stoughton. 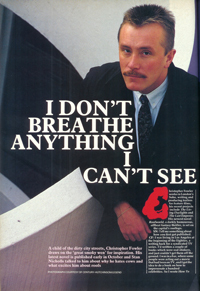 It’d be fantastic to see something like this on a billboard today. Being a second issue there were 2 pages set aside for letters, under the heading Raising the Dead. Stephen Volk is a name I recognize and his letter is an interesting response to the article on censorship from the prevous issue. Another reader complains about the lack of Fantasy and SF in issue one – something that is put right in this second issue with the Tepper interview, the Gunslinger article and a higher percentage of Fantasy and SF book reviews. Phantasm II, directed by Don Coscarelli …not sure if they’d seen this as there’s no critique, rather a simple synopsis and a comment from the fx man, Mark Shoestrom. Poltergeist III, directed by Gary Sherman …The most frightening factor about Poltergeist III is that nothing happens! Return of the Living Dead Part II, directed by Ken Wiederhorn …the audience remained fairly titterless, as did I. Dead Heat, directed by Mark Goldblatt …First-time director Goldblatt keeps the mayhem thick and fast, making the most of Terry Black’s wacked-out script. 976-Evil, directed by Robert Englund …some pictures and synopsis of the forthcoming and uncompleted film. Maniac Cop, directed by William Lustig …at once uneven and disappointing. It doesn’t live up to its potential. I’m still looking for a new twist of the knife. The Lost Boys, directed by Joel Schumacher …despit the criticism I’m liable to get for saying it, the movie was one of my favourites last year. Prison, directed by Renny Marlin …The atmosphere is claustrophobic, the special effects are over the top…and the acting is efficient. Maximum Overdrive, directed by Stephen King …don’t expect a tour de force by the man who still remains the master of modern horror. HP Lovecraft’s The Unnamable, directed by Jean-Paul Ouellette …If special effects ever swung a movie from bad to mediocre these are they. The 13th Floor, directed by Chris Roach …I’m not against lifts, mind you, but when you’ve seen one disgusting thing in a lift, or splatty lift accident, you’ve seen them all. Close Your Eyes and Pray, directed by Skip Schoolnick …Close your eyes and pray the silly end doesn’t really mean a sequel. 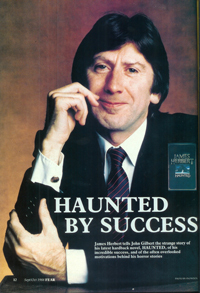 Haunted, by James Herbert; Hodder & Stoughton HB …glows softly, but consistently, with menace rather than a curb on ghoulish happenings – there are plenty of those. The Player of Games, by Iain M Banks; Macmillan HB …a book to be savoured… a book I’ll be reading again, and soon. Why Not You and I?, by Karl Edward Wagner; Dark Harvest HB …shows what pyschological horror really involves… a zest and finesse which make all his contributions to the genre essential reading, and this collection is no exception. Interzone – Second Anthology, edited by David Pringle, John Clute and Simon Ousley; New English Library PB …full of surprises, and no matter what sort of fiction you read it will provide some chilling, humorous, and ironic tastes for you to savour. Swords and Sorceress II, edited by Marion Zimmer Bradley; Headline PB …It’s difficult to express which are the best stories in this wonderful collection. Lords of the Middle Dark, by Jack L Chalker; New English Library PB …The scene is set for one blockbuster of a fantasy series. The Mask of Cthulhu/The Trail of Cthulhu, by August Derleth; Grafton PB …There stories still – literally – give me nightmares and I hope they’ll do the same for you. The Zenda Vendetta, by Simon Hawke; Headline PB …apparently targeted at easy-to-please teenagers with a couple of hours to kill and nothing better to do with them. Weaveworld, by Clive Barker; Collins PB …a remarkable combination of fantasy, horror and a bit of Clive Barker erotica. It hits hard and draws deep. A Malady of Magicks, by Craig Shaw Gardner; Headline PB …Mythological beasts, Cuthbert the magic sword who can’t abide bloodshed, plus the 500 ferrets. Space Rangers/Pirates of the Asteroids, by Isaac Asimov; Lightning PB …Methinks they’re meant for children and teenagers, but adults will equally get a quick, exciting, read from them. The Deluge Drivers, by Alan Dean Foster; New English Library PB …reeks of Star Wars technology…Excellent science fiction. And from that issue? Well, I became a devout fan of the Phantasm films, sourced The Unnamable in my local video store and enjoyed it immensly; eventually I tracked down The Believers (wonderful) and put The Serpent and The Rainbow on my list of films to see, and it’s now one of my all-time favourites. I chased down the August Derleth re-issues, and comsumed Wildwood by John Farris, and Barker’s Weaveworld. I read Haunted years later, and I think I’ve missed Prison somehow, so will have to get to that in due course – only 21 years too late! Wow, that takes me back. S&tR is still one of my fave horror films, & one of the first ones I’d ever seen that I considered a good FILM, not just a good HORROR FILM. & the Zenda Vendetta from Hawke’s Time Wars series….! Lord, I remember diving into that whole thing; still can’t bring myself to get rid of the books, though I can’t even stand to read them anymore. Still, it was a series from somebody who’d obviously loved the same books I had when I was a kid (though he didn’t seem to know many of them had sequels). They’re mouldering comfortably in the basement now. Thanks for all your hard work on this. It’s obviously an effort of love.